One game that I got to play at the Electronic Entertainment Expo last year that showed a lot of promise was Volition’s Agents of Mayhem. Agents of Mayhem returned to E3 this year, ahead of its August 2017 release, and the demo was more polished and refined. Volition previously developed the Saints Row games and experienced much success with that franchise. Agents of Mayhem is definitely a spiritual successor of sorts to the Saints Row series in some respects, but the game appears to establish its own identity. Nevertheless, it appears that Volition has a very exciting new game property on its hands. The new demo for Agents of Mayhem at E3 this year contained a much larger slice of gameplay. A lot more features, bells and whistles that were not present in the previous demo were now available. Basically, in Agents of Mayhem players take the role of an elite group of super-spies and secret agents called M.A.Y.H.E.M. (Multinational AgencY Hunting Evil Masterminds). 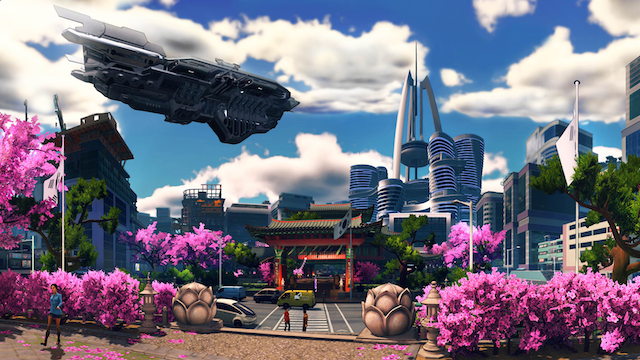 It’s a third-person action game that’s set in a futuristic version of Seoul, South Korea. Under the leadership of Persephone Brimstone, the Agents of Mayhem are out to protect the world from L.E.G.I.O.N. (the League of Evil Gentlemen Intent on Obliterating Nations). The problem? MAYHEM is filled with some rather self-absorbed, moody, somewhat amoral and egotistical agents. Granted, that’s a big part of the game’s humor. One could argue that MAYHEM might be just as big of a threat to the world as LEGION is. Since this game is apparently set within the Saints Row universe, it definitely maintains the sense of humor those games provided. 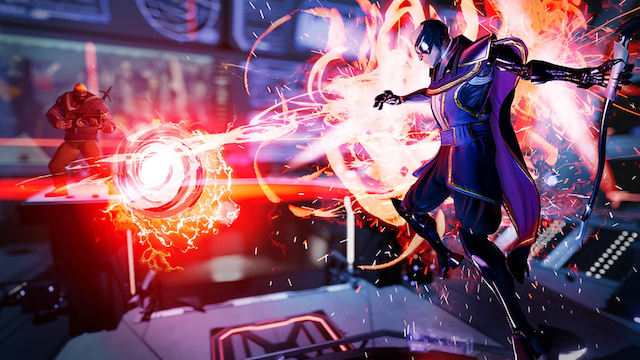 Agents of Mayhem is fun and different since it takes many of its cues from superhero comics, as well as action-adventure shows from the 1980s. The game wears its influences from the likes of G.I. Joe, 1980s TV and pop-culture on its sleeve. 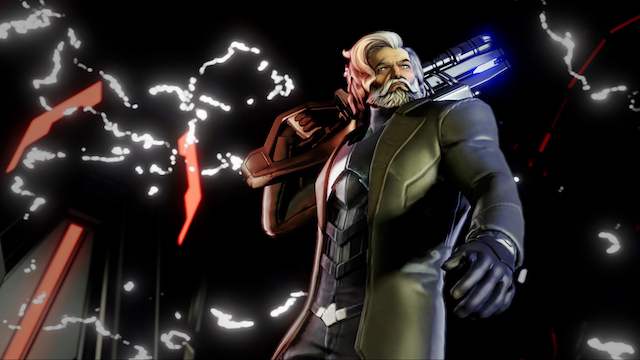 Additionally, characters in the game have alternate skins reminiscent of Marvel heroes and the avengers. So yeah; there are unlockable skins and alternate costumes for the in-game characters. Agent Yeti has a skin that resembles The Incredible Hulk. Hollywood has an alternate skin that makes him look like Captain America. Those are definitely fun touches. A new feature for the latest demo is that players were able to use Mayhem’s designated vehicle, which was not present in the E3 2016 demo. Players get to drive an AI-powered car that’s similar to KITT from Knight Rider. The car functions much like the Batmobile from Batman Arkham Knight, but it doesn’t have like a battle mode or on board weapons. You can ram it into other vehicles and cause them to explode. However, that brings me to another new aspect from the demo. There’s sort of a chaos meter, so when players cause too much mayhem or collateral destruction, it will alert an agent’s presence to LEGION, and then they will come after you. This includes attacking civilians on the street. So, as fun as it might be to attack civilians, you might want to avoid it. The main mission for the demo included targeting a jerky, villainous pop-star who is clearly meant to be an analog for Justin Bieber. Players are able to assemble a strike team of three characters. This year’s demo had a lot more playable characters. The original demo had only three playable characters. Each agent has their own personal backstory, which is told through a series of animated cutscenes that can be unlocked in the game. In addition, all the characters have their own skill trees and upgrades that they can unlock as players progress through the game. For the sake of the mission to locate the pop-singer, a computer hacker like Yeti is necessary. Unfortunately, Johnny Gat was not playable for the demo. Eventually, the agents track down the Justin Bieber clone to a hidden rave. It turns out the singer has been mind-controlling his fans; so the Mayhem agents have to take out both the bystanders, who have been brainwashed by the singer, and the LEGION soldiers. Gameplay and controls are fairly smooth and responsive. Each character has their own specialized Mayhem ability, weapons and attacks, some of which are quite fun and hilarious. So far, Hollywood’s Mayhem ability is my personal favorite. Agents of Mayhem has a great art and design style, along with its obvious comic book and Saturday morning action cartoon influences, which are incredibly amusing. The new demo really seemed to open up the game’s potential, and also showcased the Mayhem base. The Mayhem base was not present in the original demo, and that appears to be where players can handle all their loadouts and tweak a number of other features. As an open-world action game, and with the variety of agents to cause lots of mayhem and destruction, it looks like Agents of Mayhem will have quite a bit of depth and variety. Agents of Mayhem is due out on August 15. The game will be available for PlayStation 4, Xbox One and Windows PC.